Collectible ceramic salt & pepper shakers. This unique Marilyn Monroe salt and pepper shakers lingerie is a great conversation starter for any lunch or dinner. The set has two shakers. The first shake is of Marilyn Monroe in red and white lingerie sitting on a white stool. There is a fine detail of fishnet stockings and a rose pattern on the figurine’s lingerie. 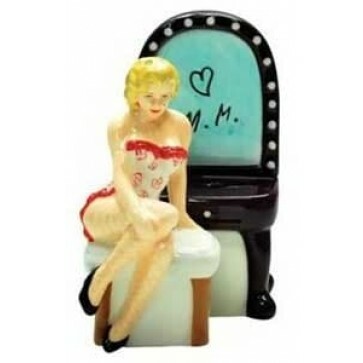 The second shaker is a black vanity with Marilyn’s initials ‘M.M’ and a heart drawn on the mirror. A row of lights lines the mirror. Each shaker is made of ceramic. All of the detailing on the shakers is painted by hand, which may result in slight variations. Both pieces are approximately 3.5” high.